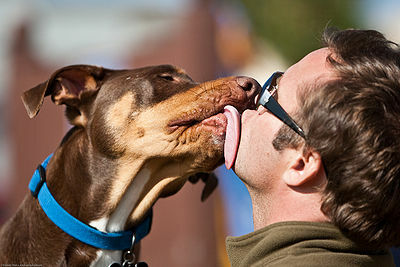 Best Friends Animal Society located in Kanab, Utah, recently ran a study to determine the differences in behavior between abused dogs and those in normal environments. The dogs in the study were selected by asking owners, who believed their dogs were abused prior to adopting them, to complete a survey. A group of five experts read the 149 histories and reported injuries. After evaluating the information, 69 of the dogs were chosen for the study. The dogs’ humans were asked to complete a detailed survey called C-BARQ – Canine Behavioral Assessment and Research Questionaire, which is considered to be the finest tool for use in studying dog behavior. The 69 dogs were compared with 5000 dogs in the C-BARQ database. The comparison was made with dogs of similar ages, the age the dogs came to live with their current humans and their living conditions when they were adopted. The dogs were found to exhibit higher levels in 12 behaviors. Of these characteristics, 8 were the most common reasons people abandoned their dogs to animal shelters. The 8 included excitability, attention seeking and attachment, fear of stairs, hyperactivity, persistent barking, rolling in feces, fear and aggression toward strange people and dogs, repetitive/strange behavior such as hoarding, digging holes, compulsive sucking and circling. Since information on the dogs before being abused was not available, the researchers concluded that the behaviors may or may not have caused the differences. Often, the abuse begins when these behaviors are exhibited. 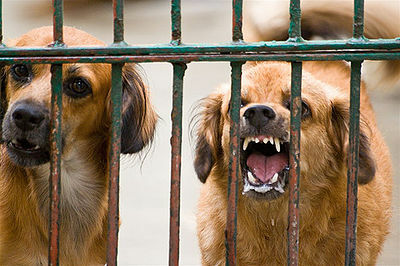 Many studies have shown that aggression in dogs, particularly those who are abused, if often due to fear. Other causes of aggression can be genetics, lack of socialization, brain injury or pain. The Best Friends research team would like to learn which kinds of abuse do the most damage and present a more difficult recovery and whether age should be factored into the outcome. Abuse takes many forms, the most common is yelling at or beating a dog. Other forms can be weaning a pup too soon, chaining or tying a dog, forcing the dog to live in a confined space such as a kennel, living outdoors with very limited or no contact with the family or other people, not attending to the needs of the dog such as feeding, grooming, health. If age is a factor in recovering from abuse, the dog may be affected for life even after adoption into a loving home. However, this does not mean that the behavior will be obvious but that some residual effects may remain. When adopting an abused dog, keep in mind that it takes time and patience for the dog to learn to trust again. Here are some tips to help an abused dog feel safe and secure in your home. Be kind and gentle, give lots of love. Do not force anything on the dog. Each dog is different and will adjust at his/her own pace. Protect your dog from situations that cause fear. Don’t punish the dog, s/he is learning about you too. Build confidence by creating successful situations. Give lots of praise for every step forward. 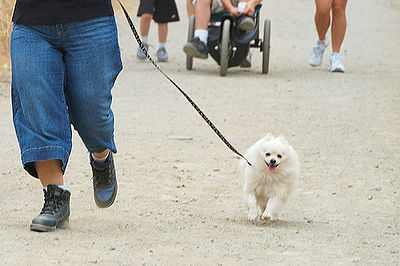 Feed your dog a high quality diet and include exercise in the daily routine. If you still have problems, consult with a homeopathic vet about remedies to calm stress in rescue dogs. Bach’s Rescue Remedy is another calming agent. The amino acid, Tryptophan, which makes us sleepy when we eat turkey, can be found in other foods such as duck, goat, quail, fish, game meat, eggs, spinach and spirulina. These foods can be safely added to your dog’s diet. You may also think about enlisting the help of an animal behaviorist. Your dog may not completely forget the bad times, but with time and patience and learning your dog’s signals, the scars of abuse will heal. You’ll be rewarded with a loving, loyal companion. On a personal note: I adopted a very badly abused dog, my Cookie, 3 years ago. While she still sometimes exhibits the effects of her abuse, she is a loving dog. It took time and patience on my part to gain her trust, but she still runs away if I raise my voice even though it’s not directed at her and she’s not quite sure of some strangers. But I can say, it is worth the effort it took to rehabilitate her. As I write this, she sits beside me with tail always wagging.